The Dodge City-based Community Foundation of Southwest Kansas and Short Grass Prairie Division of Sunflower Rail-Trails Conservancy have announced that the Foundation has awarded the Short Grass Prairie Trail (SGPT) a $3,900 grant to assist in the construction of a one-mile section of the Short Grass Prairie Trail between Coldwater and Lake Coldwater. The trail segment will enable trail users to travel safely to the lake. The project will primarily involve installing a crushed limestone surface suitable for bicyclists, walkers and wheelchair users. Currently there is no safe route for children and teens to access Lake Coldwater which has become a very popular recreational facility. Also, Southwest Kansas is currently under-served in terms of public recreational trails and this will help alleviate this shortage. The division has raised $16,000 to date for the $32,000 project and is hopeful that the remaining funds will be found in early 2017. It is expected that once this section is complete and a success, demand will increase to complete the whole rail-trail which stretches 78 miles between Coats and Protection. The Short Grass Prairie Trail will then become a destination place for residents of Southwest Kansas. Approximately, 5,000 trail user visits are projected for this trail segment annually. The Council Grove Rotary Club has built a 10-foot-wide concrete path on the railroad rock ballast surface of the Flint Hill Nature Trail from the Neosho River Bridge approximately 900 feet east to Third Street. Plus, the Council Grove Riverwalk has been extended south from the Kaw Indian Mission State Historic Site to the Flint Hills Nature Trail. So, now trail users can park at the mission and readily access the Flint Hills Trail by foot or bike. Current plans by KDWPT are to upgrade in 2017 the trail going east from Council Grove to the Kaw Heritage Park and beyond if funding is available. The park has a network of foot trails and free campsites. The section crosses scenic Rock Creek and cuts through tallgrass prairie-covered hills of the Flint Hills. A two-mile section of the South Lawrence Trafficway Hike and Bike Path stretching from Iowa St. to Haskell Avenue opened November 9. The 10-foot-wide path connects with the existing 11-mile-long path on the west side of Iowa Street. The path traverses the northern boundary of the remaining portion of the Baker Wetlands National Natural Landmark. Between Louisiana St. and Haskell Ave. a noise barrier wall reduces traffic noise for trail users, though the concrete wall is somewhat of an eyesore. This segment forms a portion of the 22-mile trail loop which will encircle the city. Rapid progress is being made by contractors working on Phase 1C of the Flint Hills Nature Trail which encompasses Pomona town West for four miles to Quenemo and east from 7th Street in Ottawa for three miles to Nevada Terrace. Six bridges are being built in the former section and one in the latter section. These sections should be open by spring. KDWPT representative Trent McCown reports that preliminary engineering work for Phase 2 is underway to upgrade the trail west of Quenemo and east of Council Grove. Field checks are currently underway by KDOT and KDWPT engineers and bids could be let as early as the end of the year. Step by step we’re seeing the development of an outstanding recreational trail which will serve as the backbone of a 215-mile interconnected trail network. Few regions in the country can boast of such an extensive trail system. Byron Rupp with the Andover-Augusta Trail Initiative reports that the organization has just entered into a Memorandum of Understanding with the City of Andover to allow it to develop the Redbud Trail from just east of Andover to US 400, a distance of about four miles. AATI has the funds to develop the trail segment and hopes to have it completed by spring 2017. Interim Trail Use. The NKCR also agreed in April to a 180-day extension for the negotiations to enter into the Interim Trail Use Agreement, but now it has notified the STB that it doesn’t want to consummate the railbanking. The three lines are Oberlin-Reager (30.8 miles); Almena to Orleans, NE (14.5 miles); and the Norton Spur (1 mile). This is a big disappointment for trail advocates as once a rail line becomes completely abandoned, it is lost forever. Losing 46 miles of rail corridors is a significant loss, especially since Northwest Kansas doesn’t have any rail-trails or rail-trail projects. Further, Sunflower Rail-Trails Conservancy spent over $3,200 in filing and legal fees in the railbanking effort. It’s possible that the Kansas Farm Bureau, which publicly opposed the trail, was able to exert political pressure on the railroad. This has happened at least twice in Kansas. Trail advocates in Oberlin and Norton may still be able to buy back short sections of the rail corridors from adjacent landowners once the land reverts. Trail advocates in Oberlin would like to build a 1.6-mile trail from the center of town to Sappa Park and Norton residents would like to use the Norton Spur and connect it to a proposed trail to Prairie Dog State Park (for a total of 4.3 miles). 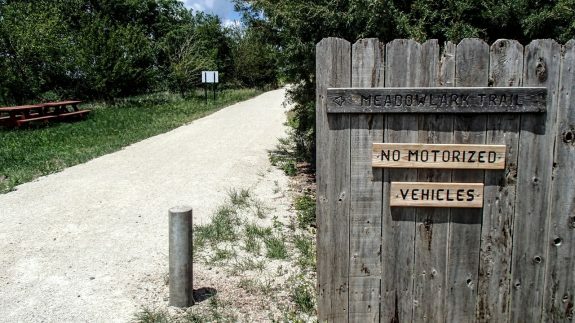 A McPherson district court judge has ruled that landowners along the 13-mile Meadowlark Trail can no longer block the completion of the trail which stretches between Lindsborg and McPherson. In a nine-page opinion, district court judge Marilyn Wilder ruled that the Kansas Recreational Trails Act provision requiring that a railbanked rail-trail be developed within two years does not apply to Central Kansas Conservancy because negotiations for railbanking the out-of-service rail line had begun before the law was enacted. According to an article in the McPherson Sentinel (9-21-16) the judge also ruled that “because federal law does not specify a time limit, no time limit exists for the Meadowlark Trail”. There is one outstanding issue which has yet to be ruled upon and that is trail crossing licenses for landowners who farm both sides of the trail. It is likely the judge will also rule in favor of Central Kansas Conservancy on this issue.